Five of the 10 children in the Nadeau family suffer from hearing loss, which whole-genome sequencing linked to a specific DNA deletion. 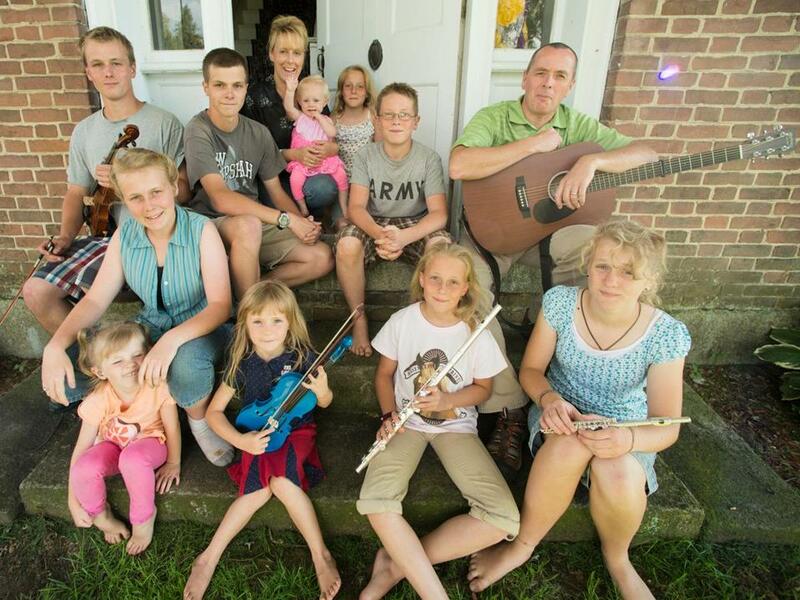 LANCASTER, N.H. — Jeanne and Andy Nadeau had one gnawing question about their large family: Would the hearing loss that affects half of their busy, boisterous household of 10 children worsen as the children grew older? The Nadeaus could prepare for the future if they knew whether the children who whisper in shouting voices and sleep soundly through violent thunderstorms would eventually become deaf or develop other health issues. Jeanne could make sure they learned sign language. But genetic tests had been inconclusive. The childrens’ problems weren’t caused by DNA mutations known to cause hearing loss. They didn’t fit neatly into any of the syndromes in medical textbooks. So, two years ago, when the parents were asked to participate in a study that would more broadly examine their family’s genes, they were interested. “If they called and said, ‘Hey, we found out something bad is coming in the next five to 10 years,’ that’d be devastating, but I’d take advantage of knowing it,” Jeanne said. Whole-genome sequencing, which scours each of the 3 billion letters of DNA to pinpoint the genetic risk factors for disease, is at a major transition point. The technology has begun to shift from a tool used primarily in research to a medical test that a growing number of hospitals and testing companies are gearing up to offer to any patient whose doctor orders it — whether it is to hunt down the cause of a mysterious illness, identify effective treatments, or search for risk factors for disease. At the forefront of this revolution in medicine, Partners HealthCare’s Laboratory for Molecular Medicine, which analyzed the Nadeaus’ DNA, has this summer become one of the first health care systems to offer genome sequencing and analysis, for $9,000. The family’s experience — the answers they got after a year and a half and the questions they still wonder about — reveals the benefits and the limits of such testing. From the technological perspective, the Nadeaus’ story is an unequivocal scientific success: The test found a specific DNA deletion that caused the childrens’ symptoms. Finding the genetic root of an unexplained syndrome is tough, and not everyone undergoing testing will be so lucky. But their experience offers a reality check, too, on the enormous enthusiasm and hype about the power of the whole-genome testing, which is still so new that researchers are unsure about which cases will be covered by insurance. Jeanne and Andy are still wondering what lies ahead. 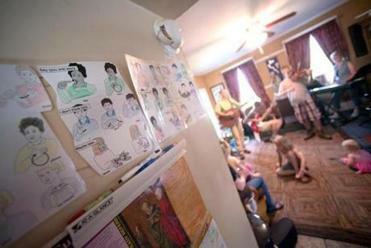 Sign language charts at the home of Jeanne and Andy Nadeau, who are preparing should their five children who suffer from hearing loss eventually become deaf. The Nadeaus are noisy, and they wouldn’t have it any other way. They have a special family dialect. Words are sometimes shaped by mispronunciations, and for the longest time, Maria, 16, would mistake a hymn’s lyrics. Instead of “Hosanna in the highest,” she would sing “lasagna in the highest.” They say “What?” a lot, but in a household of 12, that seems par for the course. Each of the children’s hearing loss emerged differently. Maria’s wasn’t caught until she was 3, when it became clear that although she could hear a dump truck thundering by, she had trouble distinguishing the sounds of letters of the alphabet. Noah, 13, communicated with a single word, “Ayuh!,” using a different inflection depending on his mood, before they realized he had trouble hearing. Newborn screening detected hearing loss in only one ear in each of the twins, Lucia and Laura, 11. Alyssa, 4, was flagged in the hospital with hearing problems. They aren’t deaf, but they don’t have normal hearing, either. The children have a type of hearing loss referred to as a “cookie bite” because the frequencies they can hear, when plotted on a graph, look like someone took a big bite out of the middle. Genetic testing of the children, looking for mutations known to underlie hearing loss, failed to find a hit, but it introduced them to the Partners Laboratory for Molecular Medicine. Heidi Rehm, the chief laboratory director, suspected that the cause of the hearing loss was a recessive genetic disorder, and that she could identify it by scouring the family’s DNA. Every person carries two copies of a gene, and Rehm suspected that Jeanne and Andy, who did not have hearing loss, each probably carried one mutated copy of a gene involved in hearing and one normal one. With one good copy, they could hear fine. But their children would have a one in four chance of inheriting two mutated copies, causing hearing loss. The team, which includes geneticists from Partners teaching hospitals, sequenced the genomes of three of the children, but that was only the first step. The lab struck out in its first attempt to analyze the data, and the case went dormant until Jeanne mentioned to Rehm that Andy’s father had suffered from hearing loss as a young man. Rehm wondered whether they might have been hunting for the wrong type of genetic problem, and her team reanalyzed the childrens’ DNA. They found 31 genetic changes in hearing loss-related genes, but no clues about which, if any, would cause problems. The researchers ultimately resorted to a different kind of analysis and found a big gap — a genetic deletion that covered four genes. The children with hearing loss had two copies of those deletions. For the researchers, this was a hard-fought victory — after months of work, they had identified the cause of the hearing loss. They’ve integrated the new information into a test for genetic causes of hearing loss, hoping to identify more affected families. They are also studying a possible connection to vision problems, after Jeanne said the children with hearing loss were having headaches, which turned out to be a sign that they needed glasses. The Nadeaus value the information they’ve gotten; they’re hopeful that they will continue to learn more. But the question that drove them to testing in the first place remains unanswered; they still do not know whether their children will eventually become deaf. As genome testing moves into the doctor’s office at a rapid pace, there is growing attention to the complexities that ensue. An organization of medical geneticists earlier this year put out controversial guidelines detailing when patients should be told about incidental findings — genes that increase their risk of diseases but that weren’t the reason for the testing. The tests also might unexpectedly provide information about other relatives’ risk for disease or for having a child with a particular condition. Dr. Bruce Korf, chairman of the department of genetics at the University of Alabama at Birmingham, said sequencing is a powerful tool, but there will be limits to how useful it can be in the doctor’s office, partly because much of the human genome has yet to be explored. In only about one in four or one in three cases is a genetic cause of a disease pinpointed, he said. Jeanne Nadeau has so far discussed the test results with her three oldest children. Maria said she had previously been told by teachers at the Governor Baxter School for the Deaf in Maine that the cause of her hearing loss was likely genetic — but had been confused because both of her parents could hear. Now she understands.